We’d love your help. Let us know what’s wrong with this preview of Exile by Rebecca Lim. Exile is the second book in a major new paranormal series that began with Mercy. Mercy's search continues ... All Mercy knows is that she is an angel, exiled from heaven for a crime she can't remember committing. So when she 'wakes' inside the body and life of eighteen-year-old Lela Neill, Mercy has only limited recall of her past life. Her strongest memories are of Ryan, t Exile is the second book in a major new paranormal series that began with Mercy. I saw this book in my local bookstore..but the first one isnt there. ..will I be able to know whats going on by reading the 2nd one? I really enjoyed this book. I literally finished the first book and started right away with this one. I got addicted. This book is a bit slower in a sense and more confined. With Mercy it revolved around mystery, suspense, romance and it had a lot of characters. Mercy interacted with a lot of people and it seemed like there was always something going on. Things kept happening. Especially because she and Ryan kept searching for Lauren and following leads, while at the same time Mercy was going th I really enjoyed this book. I literally finished the first book and started right away with this one. I got addicted. This book is a bit slower in a sense and more confined. With Mercy it revolved around mystery, suspense, romance and it had a lot of characters. Mercy interacted with a lot of people and it seemed like there was always something going on. Things kept happening. Especially because she and Ryan kept searching for Lauren and following leads, while at the same time Mercy was going through internal struggles because and while she had to deal with Carmen's life since she just couldn't just disengage from it. This book was kinda claustrophobic. It mostly took place at the Green Lantern where Lela (the new person Mercy is inhabiting) waitresses and the same characters were always there. Either because they were working there or because they just kept coming back as customers. It's like you couldn't escape them or this place. It was depressing and engulfing, especially because a lot of these characters didn't really have happy lives. Most of these characters wanted something more in life and just weren't getting it. Like Lela, with her mother dying and the things she had to give up because of her mother's illness. And like with the one character Franklin who (view spoiler)[ tried to commit suicide at the Green Lantern because he lost his job and because he thought his wife wouldn't understand him. (hide spoiler)] And also because now that Mercy's memory is coming back, her internal struggles have deepened. She also remembers Ryan, her feelings for him haven't gone away, even though she keeps dreaming of Luc. These things weren't bad though because they helped with the tone of the book. It was more depressing and traumatic, exactly like Mercy's life is turning out to be since more things are becoming clear to her. And even though she wants to remember, it doesn't mean that her past and the answers she is looking for are pleasant ones. This was an unexpected obstacle for me. It didn't even cross my mind though it should have been obvious since she's an angel. And it seemed like Ranald took an eternity to help her set up her account. Like putting in her location, taking a picture of her, etc. And I'm thinking just hurry up already! We need to contact Ryan! Anyway, I liked that we got to learn more about the angels in this book because I felt like I hadn't learned enough from the first book. I was thirsting for more. Especially because I have always thought angels were cool and I wanted to see where Rebecca Lim headed with her angel lore. And oh man the remaining 15% of the book... I won't spoil it, but here's how it left me feeling. Exile picks up exactly where the first book ended. Ripped away from Carmen Zappacosta's body, Mercy is once again thrust into an unknown life. She finds herself in a completely different season, time zone, continent.... an entire ocean away from the human boy she came to grow feelings for, Ryan Daley. Welcome to Melbourne, Australia. And our host body for the novel? Lela Neill. Lela works at The Green Lantern, a cafe which attracts a colourful and varied collection of customers - from suit-weari Exile picks up exactly where the first book ended. Ripped away from Carmen Zappacosta's body, Mercy is once again thrust into an unknown life. She finds herself in a completely different season, time zone, continent.... an entire ocean away from the human boy she came to grow feelings for, Ryan Daley. Welcome to Melbourne, Australia. And our host body for the novel? Lela Neill. Lela works at The Green Lantern, a cafe which attracts a colourful and varied collection of customers - from suit-wearing computer geeks to local strippers. It's here where most of the novel is set as Mercy slides into Lela's daily life, serving customer's coffee and advice, all the while caring for her terminally ill mother. The angel of death looms closer every day, but is Lela's mother the only soul he's come to reap? The tone of Mercy and Exile vary dramatically and while I thoroughly enjoyed the mystery and suspense of the kidnapping in the first book, I especially enjoyed the relationships formed in this novel. The secondary characters all grew on me, from the ever-quite and mysterious muslim chef, Sulamain, to Justine, the emotionally troubled stripper with an dangerously abusive boyfriend. I love seeing the ways in which Mercy will help mend tattered lives and broken bonds in the new body she resides in. Even while she's on a mission to find Ryan, not to mention uncover answers to her own existence, she still tries to find ways to help the person she's soul-jacking. To be there for Lela's dying mother, to offer Justine sanctuary and to be a beacon of hope and forgiveness to a man reeling over the edge. But she doesn't see what's right under her nose and an unsuspecting danger is growing larger, one in which she inadvertently fuels. I had my suspicions early on, but wasn't entirely sure how it would turn out. While I was right, Lim still managed to keep me gripping the edge of my seat as the climax played out, fearing the worst, hoping for the best, and preparing myself for an unexpected twist. I must also mention Luc. Luc and Mercy were once a force to be reckoned with, crazy in love. Until Mercy's unforgiving exile, which she still can't remember. Ever since, the Eight have kept them apart, hiding Mercy in body after body, so now dreams are the only way Luc can connect with her. And he's been doing so ever since she fell from grace. He's hunting though, desperately trying to find her. But he also begins to show a cruel and callous side, one Mercy has never seen in him before. Both Luc and the Eight warn her against the other. Who can she really trust? Hmmm this one wasn't as engaging as the first book. The pacing was a little slow, and I also felt Mercy was too indifferent to Lela's mom. Still a great series and I got some inklings about who Mercy really is and what she is. I’m a big fan of Mercy. The writing in the first book was descriptive, lyrical even, but not boring, the story took me a place unexpected. I loved that the story was not just of a boy meets girl, falls head over heels for her, while a battle of good and evil is waged. Instead it’s of one girl who doesn’t know who she is or what she is, and of the girl whose body the former occupies. There’s more those things in Exile, but this time Mercy is in Lena. Her story is a touch sadder and tougher than C I’m a big fan of Mercy. The writing in the first book was descriptive, lyrical even, but not boring, the story took me a place unexpected. I loved that the story was not just of a boy meets girl, falls head over heels for her, while a battle of good and evil is waged. Instead it’s of one girl who doesn’t know who she is or what she is, and of the girl whose body the former occupies. There’s more those things in Exile, but this time Mercy is in Lena. Her story is a touch sadder and tougher than Carmen’s. She’s dropped out of Uni to take care of her sick mother. She’s also working a dead end job with some very colorful characters like Reggie, tough as nails, not so much her friend as a source of an annoyance. Then Cecilla, friend of all; a brooding cook; an understanding boss, a down on her luck exotic dancer, who all made what kind of girl Lena was come clear across. And Ryan is back. What I love is the affection that’s there between them, as well as their shared history (brief as it was in Mercy.) While there were elements of “I’ll wait, I’ll wait forever, if I have to,” it was their affection and history that gave their relationship a sheen of plausibility. People who love each other, know stuff about each other. That’s one point for Exile. Now, take that point away for what looks to be a love triangle in the making. Another aspect that I enjoyed is how we catch a glimpse into her world, the unseen one. We learn of the Elohim and beings quite like herself, the Malakh. The in’s and out’s of her world, her history, what she did and didn’t do are slowly but surely getting a little clear. And I love that, that since each (re)discovery is new to Mercy, it’s new to me as well. It may not be released in the USA for awhile, but it is out here in Canada and in England and Australia, so Christine and I though we’d review Exile by Rebecca Lim. 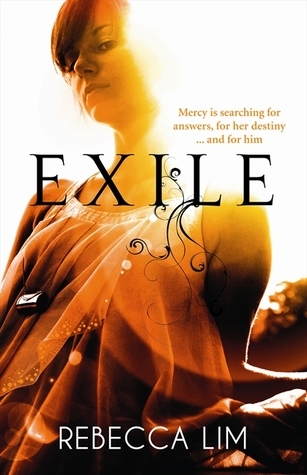 Caitlin: Directly after reading Mercy I went on Goodreads (and then Amazon and BookDepository) trying to figure out when Exile would be released. It was difficult to puzzle it out. It seems to have three different english release dates and none of them are near one another or connected or anything. So, I just sort of le It may not be released in the USA for awhile, but it is out here in Canada and in England and Australia, so Christine and I though we’d review Exile by Rebecca Lim. Caitlin: Directly after reading Mercy I went on Goodreads (and then Amazon and BookDepository) trying to figure out when Exile would be released. It was difficult to puzzle it out. It seems to have three different english release dates and none of them are near one another or connected or anything. So, I just sort of left it, and figured, when I see it in the bookstore, then it is time. I’m so glad that day came sooner rather than later. With a series that, by it’s nature, is forced to switch the cast of characters every book, I feel it is important to read the books relatively close together so you don’t lose any affinity for it. Also, I’m impatient. Christine: As am I, which is why I was so, so, SO happy that I visited Canada after it’d been released up there so I could buy it and read it THAT day. After reading Mercy, hearing that Exile would be released in the states in March of next year killed me inside. But guys, it’s worth the wait. Because it’s a good book and a great series. I just wish the publishers would get together and have ONE release date. So, let’s talk about the story for a second. At the end of Mercy, the girl Mercy is pulled away from Carmen’s body and we have no idea where she ends up. All we know is that it’s away from Ryan. (*sigh*) This is the one of the things I really like about this series. We’re learning right along with Mercy everything about the person she’s in and what she needs to do, or how she needs to act. What’s different with this book, however, is the entire time all I wanted was for Mercy to reconnect with Ryan. Caitlin: I’m pretty sure that’s aided by how much Mercy wanted that as well. At least, after she remembered who Ryan was. I was a little miffed at her forgetting the awesomeness of Ryan, but I guess we can’t blame Mercy for that. I was actually very intrigued by how many different sides of Mercy we see in this book. Her confidence that she is sent to take over people’s lives to help them. Her desire to see Ryan again and have a part of her life that is under her own control. And then there is her obsession with Luc while she is sleeping. I enjoyed how she tried to be all these things, all at once. And how each facet of her strange life blew up together at the end. Christine: Before I go off on a rant about the ending, I did like that we got some answers about Mercy’s past and why Luc visits her in her dreams and wants her so badly. While we don’t get everything told to us wrapped up with a bow, we are given enough insight that I was able to draw some conclusions about Mercy’s past and how it might play into the series overall arc. I’m looking forward to finding out more about her before she body-hopped around the world and if Luc is ever going to find her outside of dreams. Caitlin: Sigh, the ending. It was like having a piece of cake offered to you, then watching it fall onto floor and explode in mess of icing and crumbs. But, I’ll let you rant about that. I wanted to say, that I NEED to know more. Who IS Mercy?? Like, I get kind of what’s going on but why do the…uh….people who are doing this to her, care about her so much. Who was she before she was Mercy? Sigh. Also, there now seems to be a fourth book in the series but the blurb on the third still says we’ll be getting all the answers. Somehow, I doubt this. Also, I just don’t see how it could all be wrapped up in one more book. I really want there to be at least one book where she is just Mercy. Not Mercy in the body of someone else. And no more evil endings. Christine: Yes, I’d love to see her as herself. Not superimposed on someone else’s face, mainly because that’s creepy. The ending… :deep breath: The ending was just… so… UGH. SERIOUSLY?!? THAT’S how it ends?? With… with… it just looking promising and then you rip it away from us, Rebecca? Have you been taking writing advice from Richelle Mead? Because the heart ripping felt similar. Caitlin: Suddenly glad we live so far apart. Christine: So here’s how it stands: the US release date is in March, but the rest of the world already has it. If you really want to read it now, I suggest either buying it from a bookstore that will ship international (I’d start with Canada) or buy it as an e-book and get it instantly. Muse, the third book, will be released everywhere but the US on October 27th, so I’d wait until then and get two-for-one international shipping, if you want the paper copy. If you’ve read Exile, we’d love to know what you thought in the comments section. Personally I can’t wait for Muse and will be buying it as an e-book the day it comes out in Australia thanks to Borders.com.au! The second in the Mercy series. I have hardly ever given a book two stars, and never a one star, because i try and see the best in every book. But this one was different. There were too many things wrong with it. Rebecca Lim managed to sound pretentious and snooty throughout the whole book. The first few pages were okay, but then she began describing the universe and cosmos, and she couldn't quite get it right. Several times, complicated words were used, when the more simple terms would have suit The second in the Mercy series. Rebecca Lim managed to sound pretentious and snooty throughout the whole book. The first few pages were okay, but then she began describing the universe and cosmos, and she couldn't quite get it right. Several times, complicated words were used, when the more simple terms would have suited the situation more. I really hate it when authors do that- try and exhibit their sophisticated vocabulary on every page. One author who doesn't do that is the amazing Stephen King. Rarely do I come across a word which i do not understand, and this makes every book of his even more gripping. Rebecca Lim should take a leaf out of his book, cuz that guy knows what he's doing. Luc is a bad guy; everyone can see it. He's probably the devil, which is no spoiler, if the shorthand version of Lucifer is anything to go by. Of course, the only "being" who can't see it, has to be fricking Mercy. God. My major criticism of this book is Sulaiman's character. In many Australian books I have read, Muslims are generally depicted as religious fanatcis who look down on anybody who doesn't share their faith. This is another one of them. I don't understand if it's something in the water there, or something in the air, but i am really getting tired of it. And a note to the author...WHEN MUSLIMS PRAY, THEY DON'T HOLD A PHILOSOPHICAL DEBATE WITH SOMEONE STANDING NEXT TO THEM. When I first came to this point of the book, about halfway through, I wasn't sure if I was reading it correctly. Good ol' Sulaiman, standing on the prayer mat in his little kitchen, and performing all the actions involved, such as bowing and kneeling onto the floor- but then also talking to fricking Lela who was watching him with a sneer. I re-read it, and asked my friend to check it, too. We both came to the same disgusted conclusion. The writer doesn't know what she's talking about. This was the most disturbing aspect- Rebecca Lim had pinned a religion on a character, but didn't have a clue about that religion, and has thus portrayed Islam in completely the wrong way. Muslims don't talk during prayers, because how can you be having a conversation with someone whilst also praying to God? Ms. Lim- THE LACK OF RESEARCH IS SHOCKING. You should be ashamed of yourself, and so should your editors for not having picked up on it. The character of Lela was fine, but Mercy herself is quite a little witch. Case in point- all the snidey little remarks about Sulaiman, and at one point explaining a character's reaction to something with: "He's Russian." And how in the hell, Mercy, do you have the first clue about what Russians are like? Seeing as you hardly remember your past lives except for a few glimpses, and don't seem to watch the news or read newspapers. There were too many cliches and stereotypes to count. The jolly old Russian employer, the shy and quiet coffeemaker from the Phillipines, the sullen and pompous Muslim chef, the bitchy co-worker, a prostitute who was a kind soul underneath; the loving dying mother. Layer upon layer upon layer of cliches. And don't get me started on bloody Randal. He's such an idiot, really, but that doesn't excuse what Mercy did to him. Agreeing to a date when you knew you wouldn't be around to go through with it? That's just plain cold. He didn't deserve that, no matter how strange he was, and I blame what happened at the end to Mercy, the stupid little girl who has been around for millenia, but does not know how to let a guy down gently. Overall, I have many complaints about this book. I can't be bothered to write any more, but am just warning everyone that this book tries too hard, but doesn't satisfy. At all. However, on the plus side, the next in the series, Muse, sounds quite fascinating. Recommends it for: ppl i hate, ppl i want to make them suffer, ppl who want to kill themselves.. Recommended to Fafiliebe ♥ Warner ♥ Raffe ♥ by: ME!! 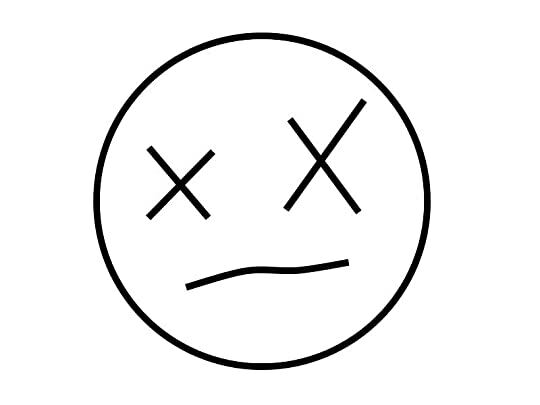 KILL ME!! I don't even care.. i am not into this series.. it feels like ageny reading it,,, it is only good for me when Ryan is around, which is not happening often.. and how come it always ends with mercy suffering from an injury at last.. i mean the plot is not interesting, it is boring in a parts.. and at the last 20 pages it get so stuffed with - everything - i don't even understand who is good and who is bad .. maybe i shouldn't maybe not until the 3rd book that is so not on my reading list next , AH I don't even care.. i am not into this series.. it feels like ageny reading it,,, it is only good for me when Ryan is around, which is not happening often.. and how come it always ends with mercy suffering from an injury at last.. i mean the plot is not interesting, it is boring in a parts.. and at the last 20 pages it get so stuffed with - everything - i don't even understand who is good and who is bad .. maybe i shouldn't maybe not until the 3rd book that is so not on my reading list next , AHHHH my head hurts ..and i am just not feeling it... i was counting the pages i wanted it to end sooo badly, Oh yeah and my eyes hurt too.. I thought that the 1st book was not all that.. but compared to this it is paradise.. there is a story at least.. here i don't get it.. i don't like it.. i just don't understand what she did, what luc did, all that i know is that those 8 freakishly gorgeous angels are trying to keep her away from Luc, since they seam to be a threat of mass destruction if they are together so they move her from one body to another. Plus i liked Mercy better in the first book, she had an attractive personality. So since at the end of each book Mercy tends to be shifted to another body, here is what i think will happen in book 3 : Mercy will wake up in the body of low life, low self esteem, troubled girl that needs help, mercy has no idea where she is, what is happening, and remember nothing other than that she can't cry, she hates heights and oh she hates to be touched, and don't ask her why.. then here comes luc in her dreams, arms around her, tells her to find him /"his beloved"/ and that she is not trying hard enough, and that he is looking for her, he is looking forward for their union.. and some how she mysteriously remembers Ryan (also don't ask her how) , and then she wants to find him and some how the story ends with the poor girl she has possessed her body lying with probably a ripped hand, with Ryan (6 feet 5 tall/ not that i am mocking him, i like him and maybe that is why i am frustrated .. i need more Ryan) any way there is Ryan weeping over the little girls body screaming for Mercy..
And some how we still don't know what the hell happened to poor malackh. I don't know you want to read it or not it is ur choice, actually when writing this review i didn't pay attention if i have put any spoiler.. OH WAIT.. THERE IS NOTHING TO BE SPOILED, not TWISTS no nothing.. not even a decent love story, all i got from this story is that in the cafe they serve coffee (the shock :/) with milk, or not, with sugar or not, any way u like it, oh and chicken sandwiches, also make sure u check the other things in the menu when poor lela is preparing them.. trust me she will tell..
this is the longest review i have ever written.. but the book just got me so frustrated.. When I read Mercy a few weeks ago, I felt the kind of excitement I hadn't felt in a long time for a YA paranormal series. It was offering me something new, a unique voice, and a mysterious setting. As soon as I finished reading it, I made plans to read the next book really soon. This is to say that, I went into Exile with high expectations. And it's not that the book let me down, exactly. It was actually quite good; just not on the same exact level as Mercy. For one thing, this book clearly suffered of being the second in a series; while it does have a story that starts and ends between its pages, I still felt it was really trying to build a bridge between the previous book and what would come in the next one(s). I also didn't like how obvious some of the "hinting" was. If someone is being shady and mysterious, show me : describe how twitchy they are, how they won't look the narrator in the eye, how they keep looking at the clock. But please don't tell me, multiple times, how John is acting strange today! That kills the suspense. I'd rather have subtle clues here and there; if I pick on them, great! And if I don't, the ending will be all the more surprising. Exile had some really strong points, too, which should probably be the main focus of this review. First of all is the beautiful imagery of Mercy's angelic dreams. She travels through infinite dimensions, from body cells to the cosmos, and it was such an amazing reading experience! I haven't read something quite like that before. That, right there, was some of my favorite reading this year. Loved it. I also love Mercy's personal story. The memories she can't keep, her strange relation to Luc, her quest to find Ryan. She has such a strong presence while being so lost. She definitely doesn't feel like a teenager, and I feel that Rebecca Lim writes her with a lot of maturity. Also, some very strong scenes. There was definitely some foreshadowing to the ending along the book, but really, I never thought it would end this way! Wow, that was a shocker! It was written in a shocking yet beautiful way, revealing more about Mercy while concluding Lela's story. There is so much to love about Mercy's story, but also about Rebacca Lim's writing. It's unique, therefore refreshing. Maybe not for everyone, but I definitely appreciated her beautiful prose. It's incredible how a character like Mercy, cold and detached for most of the time, can make me feel so much. I must start by saying that this is book 2 in the series and this review may therefore contain spoilers to Book 1 Mercy. I will also state that I am writing this review after finishing the whole series, therefore I have added insight into the plot due to the benefit of hindsight. There is very important information revealed in this book, something that doesn't automatically click into place until the very end. In this book Mercy finds herself in the body of Lela, desperately unhappy with her life, stuck in a dead end job taking care of her terminally ill mother. Underneath all the misery and despair in Lela's life you can tell that she generally cares for people. Mercy heightens this quality and it is heart warming to follow just how Mercy touches peoples lives. Improving not only the quality of life but putting their futures back on track, in essence saving them from themselves. It is this essential goodness that enables people to see beneath the surface of the body Mercy is inhabiting to the real her. Although Mercy is starting to remember fragments of 'her' life there are still huge gaps in her memory. She is still unaware of what she truly is and therefore who Luc is. The introduction of more of the archangels and background details as to their powers and place in the world not just guarding Mercy, really add depth to the plot. The connection and similarity between Ryan and Luc has yet to be fully explored, keeping the continual tension within the plot. The seedier side of life is unerringly depicted and unfortunately all to realistic. The inner workings of a psychopaths mind were disturbingly portrayed. The undercurrent of evil being hidden is a continuing theme flowing through the books. The way random acts of kindness benefit society as a whole via their ripple effect was amazing to picture similar to that of the butterfly effect (the theoretical physics not the movie) A truly fantastic concept that would benefit the world if it was put into practice. I had to read this overnight because a student at my school is waiting for it. I'm enjoying this series so far. It's not for younger girls, who wouldn't get the background issues, but fifteen years and up should enjoy it. I like the difference from other angel novels I've had to read because the students are reading them. Maybe that only says I'm an old teacher-librarian who's been through too many fads over the years and has had enough of the Gothic romances that form most of teen girl reading t I had to read this overnight because a student at my school is waiting for it. I'm enjoying this series so far. It's not for younger girls, who wouldn't get the background issues, but fifteen years and up should enjoy it. I like the difference from other angel novels I've had to read because the students are reading them. Maybe that only says I'm an old teacher-librarian who's been through too many fads over the years and has had enough of the Gothic romances that form most of teen girl reading these days. But I've found that even the girls at my school get to the point where they've had enough and want something a little different. This novel isn't the mystery/suspense that the first one was, but more about Mercy herself, in yet another body and trying to use it to get back to Ryan, the boy she met in the first book and thus back to her beloved Luc (Lucifer?) who has told her this is the way to do it. Boy, does she stuff up! But then, she doesn't have anyone to advise her except Luc and he isn't trustworthy. And when the other angels turn up to issue warnings, it's always a little late. I assumed this was going to be a trilogy, but there are two more books mentioned at the end, so we'll have to see how they pan out. The beauty of doing a series of more-or-less stand-alone books with maybe one continuing theme - the war in heaven - is that you can try something different in each book and it won't be just more-of-the-same. If you haven't read Mercy yet please do! While the angel and demon worlds are rocking the YA book world - some great and others not entirely - but Rebecca Lim's world is twisted in a very interesting way and even in EXILE, it proves that she knows what she's doing! This series gets better with each book as Mercy is fed more information about who she really is. And while this exciting plot line is developing, there's the human story that begins and ends entwined within it. I love this series. It's thrilling and different and beautifully written. I can't wait for Book 3, Muse. Gorgeous. Review to come. Hopeful the next two books will be available in the US soon since they're already both our in other countries. I doubt it, but fingers crossed because I really want to know what comes next. I loved it! The plot thickened and the characters grew within the book. Slowly but surely more and more information was discovered, about Mercy's past and her new life as Lela Neill. Loved how to book was set in Australia:P I liked it even more than the first one! It was good. I will read the next one for sure. I started really "meh" about this series. Now? hollymotherofallcows. I NEED the next book! Very boring, nothing really happened. series was great, but this book is tiring to read. Set in Australia, hekk yeah! Diversity Rating: 2 – It’s a Start! Another series, another sequel I didn’t get to read until years after I read the first book. The gap between Mercy See more of my reviews on The YA Kitten! Another series, another sequel I didn’t get to read until years after I read the first book. The gap between Mercy and Exile sets a new record for me: SIX YEARS! Well, I sure didn’t know the difference once I started Exile and found myself unable to put it down. Why can’t all sequels improve upon their predecessors so well and hook me as solidly as this one did? After rescuing two girls, Mercy gets yanked out of Carmen’s body and put into the body of Lela Neill, a miserable girl who works in a cruddy cafe in Melbourne, Australia for little money and has to watch her mother wither away thanks to end-stage terminal cancer. Mercy adapts just as quickly as you’d expect her to given that she’s changing lives all the time, though her excuse of “degenerative brain disease” to someone who asks why “Lela” suddenly doesn’t know things she should is a bit much. So this was one of four books I took with me to dogsit for a family friend for seven hours, but Exile was the book I couldn’t put down and read from start to finish while there. While reading, the notebook I’d brought with me in case I felt inspired to write reviews? I filled up an entire page with academic-esque notes about the book and its themes. THIS IS NOT SOMETHING I DO FOR EVERY YA BOOK. I haven’t taken notes on a book like this since college and that’s because I had to in order to make writing my eventual paper easier on me. Exile was just a read for fun and yet I now have a page full of analysis, parallels, and predictions for the series. Anyway. Entitled men are all over this book: stripper Justine’s ex-boyfriend continues to stalk and harass her after she escaped their abusive relationship; one of Lela’s customers clearly had a thing for her before Mercy came along and his feelings only escalate over the course of the book. In contrast, we have Franklin, who feels abused by his family’s rampant spending and becomes suicidal when he loses his high-paying job. It’s Mercy’s kindness that saves his life, but its ripple effect complicates her life, to say the least. Being that the gals of the book are surrounded by guys who feel entitled to them, it’s hard not to see how both Luc and the Eight abuse Mercy in their own ways. Whatever Mercy and Luc did while they were lovers, it messed her up and she was made to jump from person to person both to hide her from Luc and to heal her. At the same time, the Eight are using Mercy as a puppet to save people from Luc’s influence. If Mercy wants to rebel against both, I’m all for it! The book also raises the question of free will vs. fate in what controls the events of the story. 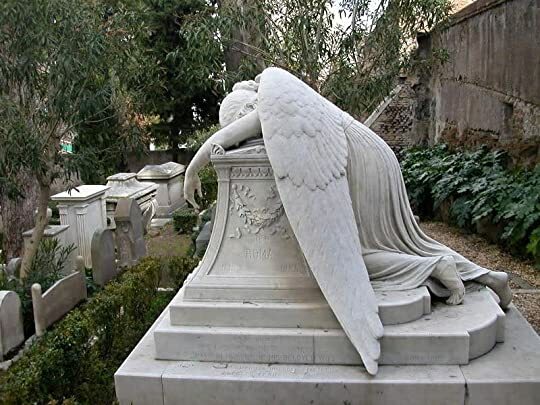 About halfway through the book, the angel Azrael makes himself known to Mercy as he waits to take Lela’s mother Karen, but he says that someone else is fated to die at the exact same time as Karen and then he will take both their souls at once. Later on, one of the Eight says that Mercy’s choice in the climactic scene determined the outcome of the event. Because of the choice she made, the ending was set in stone. He’s even disappointed that Mercy acted like herself by deciding with empathy rather than casting off empathy in decision-making as the Eight would. So does fate rule with the illusion of free will or is there truly free will? Does the world operate with a mix of both? The latter is what the case seems to be, but fate makes the existence of true free will impossible. WHICH IS IT??? But what makes this a solid sequel is that it how it’s a vital transitional book that shows the consequences of the choices Mercy made in the previous book. Though Mercy has gone through innumerable lives and bodies, Lela’s isn’t just another in the cycle. Mercy’s connection with Ryan as her true self changed the centuries-old pattern of her soul-jacking and everything in Exile is a direct result of that, signalling how further entries in the series will only escalate from here. This review has been hidden because it contains spoilers. To view it, click here. Rebecca has introduced us to a world of angels in a completley different light ! In exile, Rebecca has continued with Mercy's world - a world entirely different of its own.. An angel who no longer wants to be in exile !! She just wants to be herself, but whom is she ?? Exile continues on with Mercy being exiled from Heaven, still unsure of the crime she has committed and has been banned for. Mercy wakes to find herself in the body of Lela Neil - an eighteen year old girl who works at the Green La Rebecca has introduced us to a world of angels in a completley different light ! In exile, Rebecca has continued with Mercy's world - a world entirely different of its own.. An angel who no longer wants to be in exile !! She just wants to be herself, but whom is she ?? Mercy wakes to find herself in the body of Lela Neil - an eighteen year old girl who works at the Green Lantern, serving coffee to strippers, suits and all kinds of patrons. Lela spends her nights beside her dying mother’s bedside, sleeping in the arm chair and caring for her mother who is terminally ill. The days are long, and Lela waits for that dreaded day to come. Mercy seems to take on Lela's body a lot easier this time, fitting into this new body with more finesse and ease. Quickly falling into her new temporary life. Luc finds Mercy and still visits her, in her dreams, promising that he will find her and encourages Lela to find her Human friend Ryan. TOrn between her love for Luc and her new affection for Ryan, Mercy hunts for Ryan. Luc gives Mercy snippets to help her along the way to find Ryan in Paradise. Their must a reason behind his actions, so she searches. Along the way Mercy is discovering parts of her true self and feelings. What Mercy doesn’t know is that her actions may cause serious repercussions, and this affecting the people around her. The eight are determined to keep Mercy and Luc apart; every time he gets close to her, they banish her once again to another life. The reason behind is still unknown ? Mercy takes Lela on a whirlwind of events... some that may never be reversed. Well I must say that I enjoyed Mercy but Exile was taken a notch higher, giving it a 4 1/5 stars, it had all aspects of a great novel. It was filled with drama, murder, mystery, and suspense and even a little hint of romance. Enough to keep you intrigued, and interested and read till the very end. I read this in one sitting, and was impressed - my left jaw agape and eagerly awaiting book 3. A cliffhanger that will have you pondering in which direction Rebecca is taking us. An ending where you are definetly wanting more. A lot came about in this story. I found that Lela reminded me a lot of Carmen in the last body that Mercy inhabited, however saying that Lela's story so much sadder. Both girls torn and damaged, but Lela's story ripping and heartfelt. It certainly tugs at your heart strings, leaves you gapping at the jaw and certainly teary eyed. Rebecca surprises us with the twists and turns - leaving the reader with no idea and an ending certainly unpredictable. The plot was well defined; this was very well outlined throughout this read, chapters running smoothly from one to the next. The climax had me teary eyed!! Not at all what I expected, which is great from the readers point of view as it gives us room to be intrigued, mesmerized and I also found myself very curious and leaving myself wandering - WHAT'S NEXT ? I am growing to love Mercy's character more and more with each story; Rebecca is introducing Mercy and certain aspects into the storyline giving us insight to history and shards of the real Mercy not the body that she has inhabited. Twists and turns become about in Exile, which of course is great... New area for us to visit in upcoming books. Ryan is once again introduced, only filling a small section of this story, I would like to have seen more of him, but saying this I think we will see alot more in book 3 as the love triangle becomes about. As readers we are handed a villian, their true colours do not show till the very end. A character Im sure you will dislike and that will leave you gob smacked with the outcome. Secondary characters will have you keen and certainly interested, all viable and necessary and of course fitting into the plot like a key into a lock. Unlocking elements throughout, giving us that unexpected questions and you raising your eyes as to where the book is heading. The romance between the characters heat up in Exile ;) Cute if you may call it, but also leaving you to wander where the love will get a chance to begin. I have my own thoughts and I can see room for growth in both Mercy’s character as well as the romance, to flourish in the next book. The eight are introduced I enjoyed the background information and defiently look forward to finding out more. Overall I completely enjoyed this second Novel Of Rebecca Lims and eagerly awaiting book 3 . Als ich den ersten Band im letzten Jahr gelesen habe, war ich schnell von Mercy und dem Thema Souljacking begeistert. Jetzt, wo ich den zweiten Band beendet habe, bleibe ich ein wenig ratlos zurück, denn ich habe keine Ahnung, was ich von diesem Buch halten soll. Alles, womit mich Rebecca Lim im ersten Band begeistern konnte, ist hier plötzlich weg. Mercy wird extrem schwach dargestellt, die Handlung an sich ist bei weitem nicht mehr so spannend wie sein Vorgänger und manches kam mir nicht mehr a Als ich den ersten Band im letzten Jahr gelesen habe, war ich schnell von Mercy und dem Thema Souljacking begeistert. Jetzt, wo ich den zweiten Band beendet habe, bleibe ich ein wenig ratlos zurück, denn ich habe keine Ahnung, was ich von diesem Buch halten soll. Alles, womit mich Rebecca Lim im ersten Band begeistern konnte, ist hier plötzlich weg. Mercy wird extrem schwach dargestellt, die Handlung an sich ist bei weitem nicht mehr so spannend wie sein Vorgänger und manches kam mir nicht mehr authentisch vor. Wirklich schade, denn dieses Buch hat jedes Potenzial der Welt. Der Schreibstil ist bei weitem nicht mehr so flüssig und fesselnd, wie ich ihn in Erinnerung hatte. Die Geschichte beginnt sehr langatmig und kam nicht so richtig in Schwung, selbst zwischendurch haben sich immer wieder langatmige Situationen ergeben, die mich alles andere als begeistern konnten. Gut gemeint hat es die Autorin auch mit den vielen Wiederholungen, denn sie erzählt die Geschichte aus dem ersten Band direkt mehrfach. Das mag als Erinnerung vielleicht ganz nett sein, aber mehr als einmal wäre dies sicherlich nicht nötig gewesen. Ein paar der Dialoge sollten mit Sicherheit spannend und informativ sein, was ich dann aber gelesen habe, hat mich alles andere als gepackt. Vor allem die Gespräche zwischen Mercy und Luc konnten mich nicht überzeugen. Hier hat sich ebenfalls sehr viel wiederholt und wenn man dann doch etwas Neues erfahren hat, empfand ich dies eher als uninteressant oder viel zu kitschig. Auch die Charaktere haben konnten mich nicht packen. Mercy wird immer als ein extrem starkes Wesen dargestellt, wenn es aber wirklich drauf ankommt, wirkt sie eher schwach und verletzlich, was dann letztendlich ihre weiteren Handlungen immer unglaubwürdiger erscheinen lässt. Ich hatte große Mühe, Mercy auch in diesem Band zu mögen. Mit Lela hat sie sicherlich keine einfache Person erwischt, ihr Leben ist hart, voller Arbeit und mit vielen Emotionen ausgelastet, da ihre Mutter an Krebs erkrankt und sie auf der Arbeit schikaniert wird. Aber dennoch hätte Mercy hier einiges mehr aus ihr herauskitzeln und verbessern können. Bei Luc und Ryan sieht es genauso aus. Zwar spielen beide eine Rolle in Mercys Leben, aber wirklich viel bekommt man davon nicht mit. Mercy berichtet zwar immer wieder davon, was sie empfindet und was sie sich wünscht, aber es kommt leider nicht authentisch rüber, vielmehr hatte ich immer mehr das Gefühl, dass sich Mercy nur etwas einredet, um sich weiterhin zu spüren. Interessant ist vor allem, wieso Ryan und Mercy so viel empfinden, denn im ersten Band kam dies überhaupt nicht rüber. Sie hatten zwar gegen Ende ein freundschaftliches Verhältnis zueinander, aber das war es auch. Leider hat Rebecca Lim mir immer wieder das Gefühl vermittelt, dass ich etwas wichtiges vergessen habe, doch auch nach dem wiederholten Lesen der letzten Seiten des ersten Buches, fiel mir keine großartige Verliebtheit auf. Nicht ganz uninteressant ist allerdings, was Mercy über ihre Existenz erfahren hat. Das meiste konnte ich zwar bereits erahnen, aber dennoch war es schön, alles nochmal aufgelistet zu bekommen. Ob dies jedoch Mercy als Wesen/Person interessanter macht, bezweifel ich, denn es fiel wie gesagt schwer, sie in diesem Band zu mögen. Wunderschön ist wieder einmal die Covergestaltung, die sich an das Cover des ersten Bandes hält. Die zarten Farben und das wunderschön betonte Auge spiegeln die Handlung wieder und stehen für die Zerbrechlichkeit, die Mercy manchmal in sich trägt. Mercy was a fantastic book, so after a few minutes debating whether I wanted to read the sequel or let the first book stand on its own, I went ahead and bought Exile. And boy, I rather wish I hadn't. So first, I want to say that Rebecca Lim writes beautifully. Her lyrical prose was all that kept me going at a few points. Now, onto the bad. A fat lot of nothing happens in this book. Mercy wakes up in a new body and once again struggles to adapt to the new girl's life. Oh, and Luc tells her to f Why?! Now, onto the bad. A fat lot of nothing happens in this book. Mercy wakes up in a new body and once again struggles to adapt to the new girl's life. Oh, and Luc tells her to find Ryan from last book because he loves her and so Luc can use that to make him and Mercy be together. Say what? The events of the last book took place over one week, during half of which Ryan thought Mercy was a normal girl! Sure, they clearly grew fond of each other over the week, but this seems to me like Lim milking the insta love trope we find all too often these days in YA. In fact, I picked up the first book because reviews promised it didn't have that. And in Exile Mercy has basically a one track mind when it comes to finding him, not just because Luc tells her to but because she is in love with him. (Not that the narration ever says so, but her actions and feelings make it pretty clear.) Mercy's drive to find Ryan is so selfish that it erases what I liked about her character in the first book, that she makes the best of her sticky situation by pushing her hosts in a better direction in life. It's especially frustrating because her love for him really doesn't seem to have much of a basis aside from his being gorgeous and in love with her. Ryan also comes off as incredibly irresponsible, dropping everything to fly halfway around the world to pick her up within the week. This after the author states that he's still in school--and finally starting to pass his classes because he's finally putting work into them. I mean, it is sweet that he's so devoted to her, but I think the problem here is the lack of development. Last book we saw him and Mercy becoming friends over a week, and this book we are informed that he is now madly in love with her. It's a jump the author just told us instead of showing. Also, what made Mercy's selfishness particularly painful this book is that her stupidity directly causes (view spoiler)[her host girl to die. I can get behind Mercy not understanding internet security, but she connects the dots in the end about why her actions were stupid and yet she barely feels any regret that her selfish actions led to Lela getting shot. No, she's only sad because it means she can't be with Ryan. And what's with that stupidly long and drawn out death where she stops to have a long chat with another angel? (hide spoiler)] I'm really not a fan of how Lim stops time to tell the reader things. That's not to say it was all bad. Lim's writing is beautiful as before and there were scenes that made me cry. She has a talent for capturing the beauty in small, ordinary moments in life. There was the memory last book of a previous girl and her boyfriend walking home at night, and this book the mother shares a beautiful memory of being on a houseboat. They sound so bland as I describe them here, but in Lim's hands the memories are something lovely, something even strangers like the reader can relate to and cherish. Like the first novel, Mercy is brought back to the normal world in another persons body. This time around, before she goes into the next person, the novel goes to meeting Luc again. Luc is Mercy's "companion, or Immortal lover" so to speak. We learn more of their relationship when he meets her in her dreams. This concept was a nice way of introducing the reader into the story again. In this dream like state before she goes into another body, Luc sets up a plan for him and Mercy to meet again. In Like the first novel, Mercy is brought back to the normal world in another persons body. This time around, before she goes into the next person, the novel goes to meeting Luc again. Luc is Mercy's "companion, or Immortal lover" so to speak. We learn more of their relationship when he meets her in her dreams. This concept was a nice way of introducing the reader into the story again. In this dream like state before she goes into another body, Luc sets up a plan for him and Mercy to meet again. In her past body, Luc says that he was really close, but he was too late. Something is going on with this plot, because I think Lim wants to show the reader background into how/why they are meant to be together. Mercy is then put in Lela Neill's body (she in university), who works at a cafe. I thought this part was a little slow at time, but it only picked up when Mercy started chatting with Ryan again through the computer scenes. A young man by the name of Ranald (who has a crush on Lela) helps her set like an facebook account through his laptop. Once she finally talks to Ryan who is in love with Mercy, he tells her that he will be there in two days. OK- I am a little torn at who I want her to be with- Luc or Ryan, am leaning towards Ryan....? When he arrives that day, major events escalate during this scene. Firstly SPOILER --Mercy wanted to leave with Ryan but felt guilty for setting a date with Ranald. So she sends Ryan to go across the street to wait for her. With her still being inside the cafe, Ranald comes back from the washroom, swipes a gun and kills himself and Lela because nobody gave him the time of day or attention. So with Ryan outside worrying about Mercy, it is Lela's time to go, but we have a guest when she is in this dimension- Micheal (he is like a guardian for Mercy, along with 7 other people from her past centuries ago. We get a little more background about Luc, which from these 8 people are trying to protect her from Luc (has too much power) but he is always so close to her, so they move her over and over. But they will try to separate them. Her reunion with Ryan was lovely even though it was short-lived. Those two do tug at my heart. I like Rebecca Lims writing throughout the book, and she put in a lot of detail of what was happening around where Mercy was, but I felt that she could've taken some parts out and were repetitive. I did feel bored at some parts (I admit) but she does tell a good story. This concept is really unique, because you can envision what Mercy is doing and thinking. All the covers are pretty also! I also want to know more of what gonna happen next!! This time when Mercy awakens as Lela, a waitress in a dingy cafe in Melbourne Australia with a terminally ill mother. Luc comes to Mercy in a dream telling her that he will be able to find her through Ryan. While waiting for Ryan’s arrival, Mercy finds herself longing to be with him more and more while growing confused about her feelings for Luc. As Mercy finds herself remembering more, she is becoming more determined to learn the truth of who she is and who to believe. Because of the complexity This time when Mercy awakens as Lela, a waitress in a dingy cafe in Melbourne Australia with a terminally ill mother. Luc comes to Mercy in a dream telling her that he will be able to find her through Ryan. While waiting for Ryan’s arrival, Mercy finds herself longing to be with him more and more while growing confused about her feelings for Luc. As Mercy finds herself remembering more, she is becoming more determined to learn the truth of who she is and who to believe. Because of the complexity of the plot of this series, you really must read Mercy before delving into Exile. With that being said, what a great continuation of Mercy’s story! The backdrop of Exile feels much different than Mercy. Carmen’s life was pretty ordinary. A teenage girl surrounded by snobby teen girls, while Lela’s life is very depressing. Mercy was also a little more action packed with the mystery surrounding Lauren’s disappearance, while Exile is more about the growth of Mercy’s internal struggles and the more romantic development of her relationship with Ryan. I find Mercy’s love interest with Ryan refreshing. Where most YA romances are quick and superficial, Ryan and Mercy were based on friendship first. I love how Lim knows just how much to reveal about Mercy making the reader desperate to continue to search for the truth of her. Mercy never wakes up and just remembers everything. Her strength and knowledge are directly linked. When one grows, so does the other. This gradual progressions keeps me wanting more! I'm giving this book a 3.5. This book was...it was good. It was captivating so that I read it all in one day. It had it's ups and downs; it wasn't perfect, but it was good. Mercy wakes in Melbourne, Australia (why not Sydney? :( I live in Sydney!) as a teenager called Lela who works in a cafe called Green Lantern and has a dying mother with cancer. The first book was full of suspense but this was sorta...confined. It all took place in the grubby and overflowing cafe. I was so annoyed at Mercy. Cle I'm giving this book a 3.5. This book was...it was good. It was captivating so that I read it all in one day. It had it's ups and downs; it wasn't perfect, but it was good. Ahem. Just keep an eye on him. I LOVED the part when Ryan chats to Mercy and when he comes for her. That was the bestest! Exile is book two in Mecy series by Rebecca Lim. Exile is a fast-paced novel that I couldn't put down. Mercy is a fallen angel who is no longer with her love, Luc. Mercy was sentenced to Earth with no control over where her path would take her. Mercy takes over Lela Neill's body. Lela is a college student who is responsible for her sick mother. Mercy has to learn to adapt to Lela's lifestyle and personality. The plot from the first book continues when Mercy learns she has the ability to remember Exile is book two in Mecy series by Rebecca Lim. Exile is a fast-paced novel that I couldn't put down. 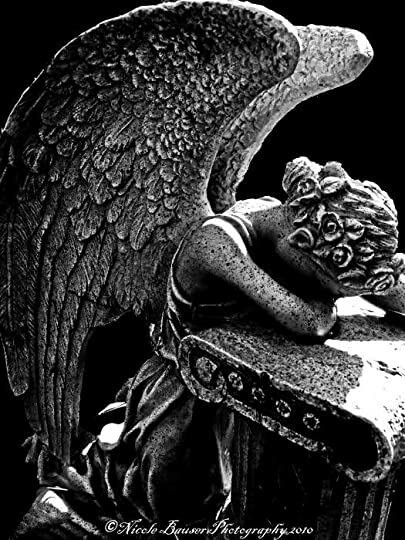 Mercy is a fallen angel who is no longer with her love, Luc. Mercy was sentenced to Earth with no control over where her path would take her. Mercy takes over Lela Neill's body. Lela is a college student who is responsible for her sick mother. Mercy has to learn to adapt to Lela's lifestyle and personality. The plot from the first book continues when Mercy learns she has the ability to remember past experiences and thinks she may find a way to reach Luc. It's easy to like this series. The covers are pretty, Rebecca Lim's writing is rather lyrical and not-so-boring, and the storyline is a lot different from other angel books for YA. But within the second book I still haven't found a deep connection with this series. MERCY was an entertaining book, not extraordinary but not so terrible as some may think. But that's kinda it. Done. And EXILE is exactly like that too. The first half of EXILE is close to being a re-written version of MERCY; she has a It's easy to like this series. The covers are pretty, Rebecca Lim's writing is rather lyrical and not-so-boring, and the storyline is a lot different from other angel books for YA. But within the second book I still haven't found a deep connection with this series. MERCY was an entertaining book, not extraordinary but not so terrible as some may think. But that's kinda it. Done. And EXILE is exactly like that too. The first half of EXILE is close to being a re-written version of MERCY; she has a new life to adjust to. That makes the book rather slow and meaningless at first, since you already seen what you've been showed once before. If it wasn't for the writing I don't think I would have gotten though this book, to be honest.